i have several fields from secondary data sources, i can see which fields they are. But it is showing a 2nd secondary data source, but i dont see the field that it is using, how would i determine this field??? Fields from the secondary data source obtain an orange tick as a visual cue when they are in a visualisation. In the example below Region is from the secondary data source. Jon, the issue may simply be that you have enabled the "link" icon next to a field for a data blend, but you are not actually USING any fields from the blended data source in any of your worksheets. do i just unclick the link in the primary data source?? Yes. That should do it. 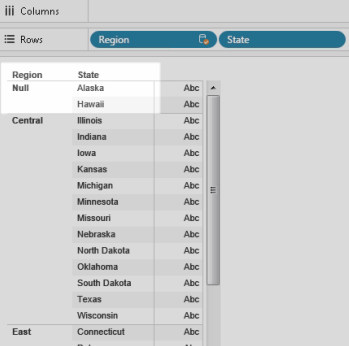 I have seen Tableau have trouble forgetting that linkage. Don’t worry too much if you still send the orange check mark if you have confirmed that no fields from the secondary source are actually being used in a viz.